How many roads must a man walk down? How many times must a mythical creature explain that, yes, an iPad can replace a laptop depending on what you want to do? If utility were a snake, it would have bit Quartz’s Mike Murphy and he would have expired still lamenting Apple’s woeful product offering. That is, of course, not the page title of the article, which is a much more sensible “Should you wait for a new Apple MacBook Pro or get an iPad Pro?” Dressed like that it might actually have been helpful as some people might be in a holding pattern waiting for the expected MacBook Pro update. Sadly, this is dressed up like a crazy-painted poodle. With a monkey riding it. And the monkey hates logic. He also hates the parrot on his shoulder that does nothing but curse in Romanian. The only thing the monkey and parrot have in common is their hatred of the poodle. But the poodle is unmoved by their hatred. She died inside a long time ago. In the last few years, Apple has pretty much abandoned its customers interested in buying a cheaper laptop. When, exactly, did Apple embrace those customers? The MacBook Air starts at $899, which is about as low as Apple’s gone in recent memory. The most affordable Mac laptop model, the 11-inch MacBook Air, has barely been touched since 2011. Possibly because it’s a pretty good machine even now. But it’s cheaper and better than it was. The clock speed is the same, but the power usage is less, making battery life considerably longer. …and only a 256 GB hard drive (compared to 128 GB back then). Actually, no! The base 11-inch MacBook Air still has a 128 GB drive. So, you missed out on an opportunity to complain! Sad! The thing is, the MacBook Air is clearly on the way out, being replaced with the new MacBook. Murphy seemingly discounts this when it is, in fact, almost the entire point. All the innovation is going into the MacBook. The Air has mostly just been getting cheaper. But if Apple is killing the Air, the iPad Pro becomes the lowest-priced “computer” product that the company sells. Does the tablet really work as well as a laptop? BZZT BZZT BZZT, FALSE CONUNDRUM ALERT. First, this is assuming the prices stay static. 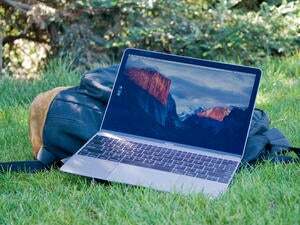 Second, as the Macalope said, $899 is about the cheapest Apple has sold a laptop for in years. Even the last plastic MacBook Apple sold in 2009 was $999. You don’t always get the price choice you want. That’s not how this works. Some believe that if you strap a nice keyboard onto the iPad Pro, you can use it as you would your laptop. The iPad Pro can be a laptop replacement… depending on what you’re doing. There. That’s it. This has nothing to do with what some people “believe”. For some use cases it works, for others it doesn’t. In all this talk, the Macalope finds it funny that no one ever wrings their hands worrying about the reverse, the use cases in which an iPad Pro is more suited than a laptop. An iPad Pro can give you better battery life, more security, better focus, pen-based graphic input and any number of other benefits over a laptop. But apparently all we’re supposed to be concerned about is whether or not we can compile C# code or something. The iPad Pro is an excellent device if all you want to do is check the occasional email, watch a movie or two, and maybe check in on Facebook. Is this performance art? A cry for help? The Macalope doesn’t even know what to do with this. The Macalope regularly writes his column on an iPad. People use them for “real work” every single day. Somewhere Federico Viticci loudly ground his teeth in anger, although he did not know why. Get whatever works for you. Don’t listen to the fantastically obtuse collection of pundits who refuse to understand people have different use cases. …the MacBook and the MacBook Air are not good choices right now. The only Mac choice left is the MacBook Pro, which starts at $1,300. The MacBook was just updated a few months ago. If that does the job for you — and it easily could as long as you don’t need multiple ports — run out and buy one right now! The Air almost certainly won’t see a serious upgrade again, if any at all. But as far as historical prices of Apple laptops go, it’s priced to move. As for the MacBook Pro, you should avoid buying one right now, unless you’re being held captive by nomads who demand you develop some bespoke mobile apps for their roving scorpion-extermination service, as this line is widely expected to receive a pretty big update soon. What, are we playing Apple trope bingo now? Meanwhile, the Macalope’s 2012 MacBook Air is sailing along perfectly, almost annoyingly so because the horny one would kind of like to upgrade but he doesn’t have a really good reason to. You have to go up to a Razer to get Apple-level build quality from a Windows laptop and, guess what, they cost a lot of money. Apple laptops are built better and, like all Apple products, they hold their value better. That’s worth something. Even though it never seems to find its way into these calculations because it doesn’t fit into a square on a matrix of specifications. It seems ridiculous that the Macalope has to say this, but look at what you need to accomplish with a computer (and in what circumstances) and then buy the device that’s going to best fit your needs and budget. It might be a MacBook, it might be an iPad Pro, it might be a Windows device. But don’t let anyone tell you that any one of them isn’t the best for certain needs.